Designed as a high-speed driver for 12-bit ADCs, the AD8137 controls SPDT GaAs (gallium-arsenide) FET-MMIC (microwave-monolithic-IC) and PIN-diode RF switches and thus provides a low-cost and versatile alternative to conventional switch drivers. This circuit achieves typical switching speeds of approximately 7 to 11 nsec, including the propagation delays of the driver and RF load. Figure 1. ADC driver IC1 converts TTL levels to differential-control signals for GaAs RF switch IC2. 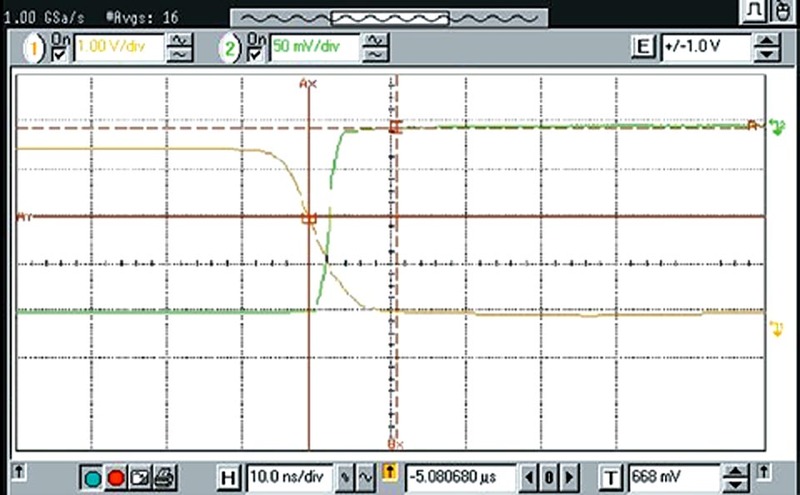 For a symmetrical output swing, gain-setting resistors R1 and R4 must present the same Thevenin-equivalent resistance. In Figure 1, R4 increases by 20 Ω over R1. 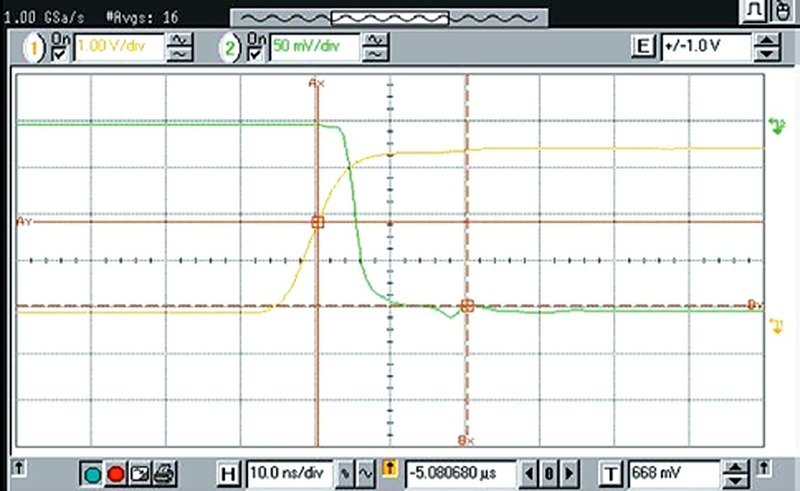 This increase compensates for the fact that source resistor RS and termination resistor RT combine in parallel to introduce additional resistance of 25 Ω. Setting R4 to 1.02 kΩ (the closest standard value to 1.025 kΩ) ensures that the circuit will provide approximately equal gains at the differential outputs. Figure 2. Vertical cursors denote GaAs switch turn-on time of approximately 5 nsec. The AD8137's VOCM input (Pin 2) offers a convenient method of shifting the outputs' dc common-mode level. 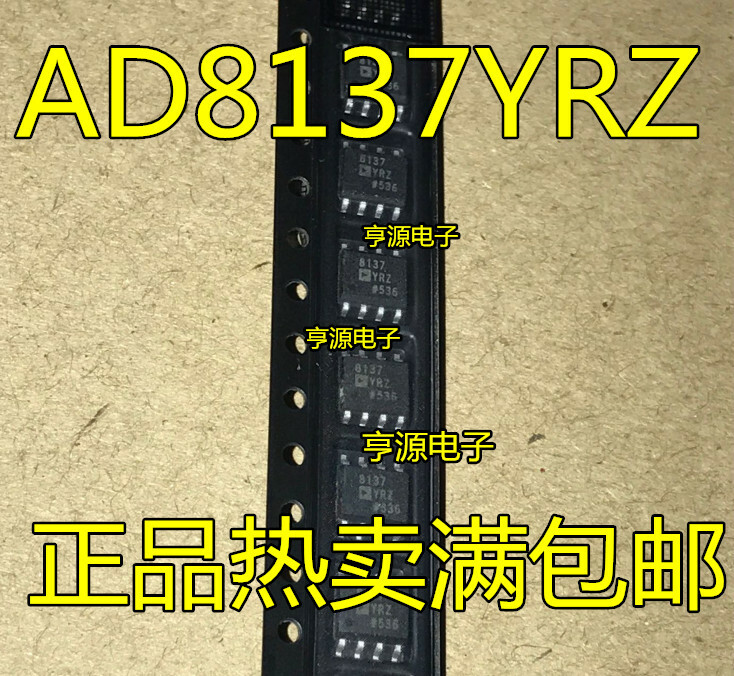 In Figure 1, R2 and R3 form a voltage divider, which sets the dc output level to –2 V. Connecting the AD8137's inverting input to a reference voltage of 1.75 V establishes the midpoint of the input signal and allows for proper switching of the AD8137's input stage. Figure 3. Turn-off time is approximately 11 nsec. Figure 2 shows the GaAs FET driver's turn-on switching speed of approximately 5 nsec for isolation to insertion loss – that is, 50% of the TTL input to 90% detected RF. Figure 3 shows turn-off switching speed of approximately 11 nsec for insertion loss to isolation – that is, 50% of the TTL input to 10% detected RF. Figure 4. A few modifications convert the circuit in Figure 1 into a PIN-diode switch driver.